When people ask me if I like Game of Thrones, I tell them I don’t: I love it. Maybe too much. I’m that diehard fan of the Song of Ice and Fire series who’s devoured every bit of fiction that George R.R. Martin has released several times over. I’m that guy who gets deeply caught up on every minor deviation that the HBO adaptation makes from the source material, no matter how small. I’m the guy who goes to a Game of Thrones trivia night and argues with the quiz-master. And, as a fan of Game of Thrones during the show’s peak popularity, there’s been no shortage of games - both physical and digital - out there that try to capture the things I dig about the show. The venn diagram between people who watch Game of Thrones and people who enjoy fantasy games like Skyrim and The Witcher isn’t quite a circle - but it’s not far off. By comparison to a lot of these earlier efforts, Reigns: Game of Thrones is a little more modest in its ambitions. It’s a game that doesn’t just work within its limitations, but thrives within them. 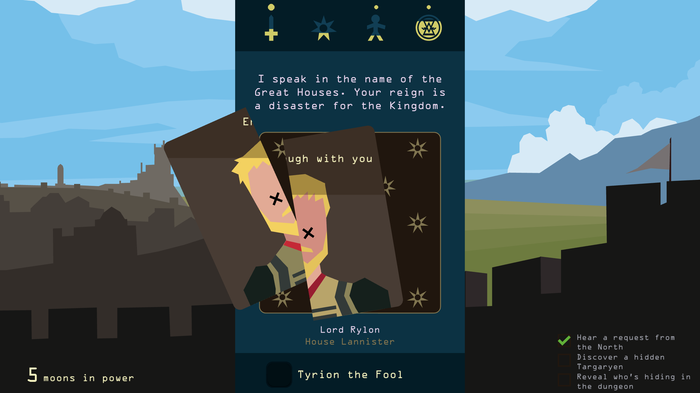 For better or worse, Reigns: Game of Thrones feels like a true a mobile-first experience - one that probably wouldn’t work nearly as well on any other platform - and one that ultimately lives and dies on its theme. The short version here is that Reigns: Game of Thrones is a re-imagined take on of the Tinder-inspired, feudalistic management game, which first launched in 2016. You start the game as the ruler of the Seven Kingdoms, and then are forced to make decisions that will either stabilize or destabilize your rule over the realm. Like previous Reigns games, you make those decisions by either swiping left or right. Compared to the sprawling RPGs and bloated strategy games that have attempted to adapt the source material, this casual format makes the game super-easy to pick up and play (though disaster is only ever a few swipes away). However, in contrast to earlier Reigns games, there are multiple named playable characters in Game of Thrones. These add a new quirk to the game’s core mechanic in that you aren’t just playing as a stand-in for yourself but potentially roleplaying a character you know. More often than not, I’d forgo the smarter choice in lieu of the choice that felt natural for the character I was playing. There are nine characters total (with each unlocked through play) and a fun, fan-fiction-esque, playfulness that comes with discovering just how each ended up on the Iron Throne. Given the looming shadow of the show’s final season, the start of each character’s journey almost feels like jumping a few episodes into the future. Of course, sitting on the Iron Throne isn’t all you’ll be doing. Depending on how things shake out, you’ll also go to war with unruly houses and travel north to face the threat presented by the White Walkers. In line with the source material, the decision-making that’s central to the Reigns experience quickly becomes a tense balancing act. The trick here isn’t just in keeping everyone happy - but in not keeping everyone too happy. Anger the existing nobility too much, they’ll turn on you. However, if you don’t engage with them enough - they’ll sense weakness and turn on you anyway. Fail to pull off this trick, and your character will meet a suitably-grisly end. The one fatal flaw here is that unlike previous Reigns games, there’s no linearity to the game’s timeline. In those games, death would see you return to the throne by taking control of your offspring. You’d pick up where you left off, and have to deal with intergenerational consequences. However, in Reigns: Game of Thrones each death resets the status quo. This means that, after only a few hours, it all gets a little too familiar. Sure, you’ll still occasionally run into an encounter or two you haven’t seen before but it’s a case of diminishing returns with each run - this, in turn, serves to reveal the inherent shallowness of the game's format. 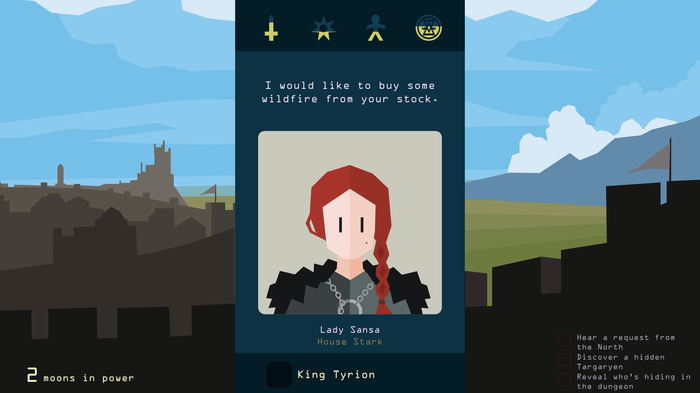 For what it is, Reigns: Game of Thrones is a fun little mobile game that fans of the Game of Thrones (or the Song of Ice and Fire books the show is based on) will probably get a kick out of. The novelty wears thin once you’ve seen the bulk of the scenarios the game throws at you, but it’s priced well and its easy to pick up and play. 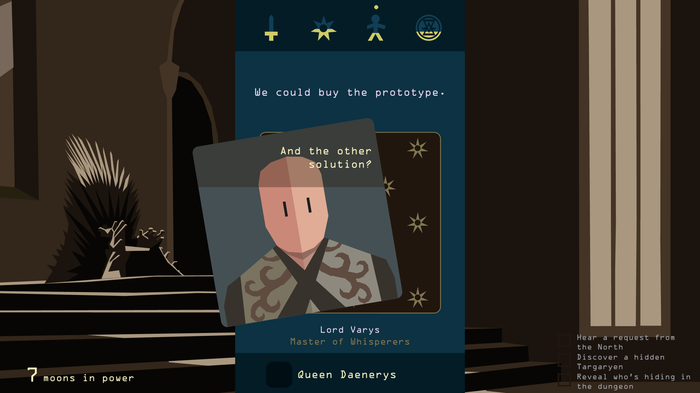 Reigns: Game of Thrones nails its source material’s ongoing ideation on the relationship between decisions and consequences in short bursts but if you’re looking for something with more depth and replay value, you’re better looking elsewhere. 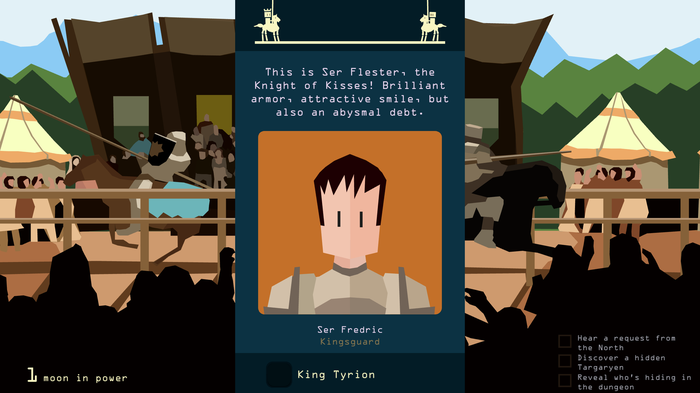 Reigns: Game of Thrones is available now on iOS, Android and PC.